See scan - perfect condition. This is a nice and rare Polish Circus commemorative or merit pin badge with nice enamel work and showing an acrobat on a horse. 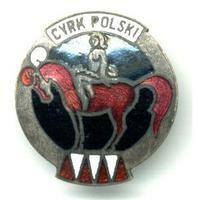 Nice circus collector piece and one of the nice Polish pins.